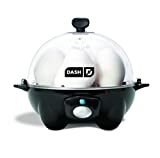 At $20, the Dash Rapid Egg Cooker with Auto Shut Off Feature is probably the best kitchen bargain on the planet. This great little gadget makes it so easy to cook eggs in a bunch of different styles each morning, and the auto shut-off feature ensures that they’re cooked perfectly every time. If you don’t already have one, or if you want to get started early on your holiday gift shopping, Amazon is running a sale right now on this great device that somehow makes it even more affordable than normal!